Sedimentation survey of Lake Decatur's Basin 6, Macon County, Illinois. Sedimentation detracts from the use of any water supply lake by reducing lake depth and volume, with a reduction of reserve water supply capacity and possible burying of intake structures. Sedimentation of a reservoir is a natural process that can be accelerated or slowed by human activities in the watershed. 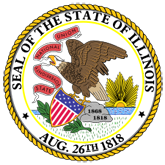 Lake Decatur is located in Macon County, northeast of Decatur, Illinois. The location of the dam is 39 49 28" north latitude and 88 57 30" west longitude in Section 22, T.16N., R.2W., Macon County, Illinois. The dam impounds the Sangamon River in the Sangamon River basin. The watershed is a portion of Hydrologic Unit 07130006 as defined by the U.S. Geological Survey. The lake was constructed in 1922 with a spillway level of 610 feet above mean sea level (feet-msl). In 1956, a set of hydraulic gates was installed on the original spillway to allow variable lake levels from 610 feet-msl to 615 feet-msl. The portion of the lake surveyed for the present study was Basin 6 located above Rea's Bridge Road. This basin of the lake is the headwater area of the main body of the lake. Lake Decatur has been surveyed to document sedimentation conditions eight times since 1930. Five of these survey efforts (1936, 1946, 1956, 1966, and 1983) were sufficiently detailed to be termed full lake sedimentation surveys. The present survey is not considered to be a full lake sedimentation survey. Sedimentation has reduced the basin capacity from 2,797 acre-feet (ac-ft) in 1922 to 1,451 ac-ft in 2000. The 2000 basin capacity was 48.1 percent of the 1922 potential basin capacity. For water supply purposes, these volumes convert to capacities of 911 million gallons in 1922 and 473 million gallons in 2000. Sedimentation rate analyses indicate a decline in annual sediment deposition rates from 35.4 ac-ft for the period 1922-1936 to 8.3 ac-ft annually from 1983-2000. The long-term average annual deposition rate for 1922-2000 was 17.3 ac-ft. Density analyses of the sediment samples indicate that the unit weight of sediment in the northern (upstream) portions of the lake is greater than the unit weight of sediment in the southern end of the lake. In general, coarser sediments are expected to be deposited in the upstream portion of a lake where the entrainment velocity of the stream is reduced to the much slower velocities of a lake environment. These coarser sediments tend to be denser when settled and are subject to drying and higher compaction rates as a result of more frequent drawdown exposure in the shallow water environment. As the remaining sediment load of the stream is transported through the lake, increasingly finer particle sizes and decreasing unit weight are observed. 1. Sedimentation survey of Lake Decatur's Basin 6, Macon County, Illinois. (20060930185831_ISWSCR2001-07.pdf).